3.) On the bottom-left pane of the Notes window, click Edit Import Settings to go to the Import a Blog window. 4. Check the By Entering URL… check box by clicking it, and then click the Start Importing button. 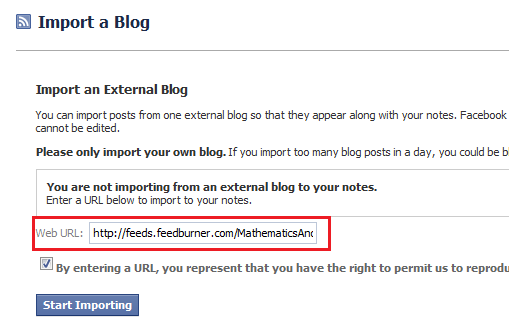 After you have done the instructions above, all future blog posts will be automatically imported in your Facebook wall. Unfortunately, you can only import a single blog using the steps above. If you have more than one blog, you will have to use another strategy to do it, and we will discuss it in the near future. Follow Math and Multimedia on Twitter. Subscribe to Math and Multimedia’s RSS Feed.